The touch. The feel of Tom’s mustache is enough to make me dreamy eyed for more than a month. 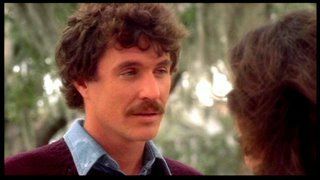 Maybe it’s the hair and the mustache that’s makes me sing “Tracks of My Tears” each and every time I see The Big Chill, which was only once because romantic comedies make my brain explode. Romantic comedies do not make me feel more romantic – they make me feel like knocking back 44 cocktails and passing out in a dumpster. Anything is better than paying $10.95 for some kissy-poo mess with a 3-D happy ending. Tom’s brother in mustache crime has to be Kevin Kline, who ironically was also in the Big Chill, without a stache. Now I see why. Here’s Mr. Kline doing his best Tom B. in A Fish Called Wanda. This entry was posted in Uncategorized and tagged A Fish Called Wanda, Cocaine Cowboys, Kevin Kline, Rivi, Rivi's Manifesto, The Big Chill, Tom Berenger, Tracks of my Tears. Bookmark the permalink.